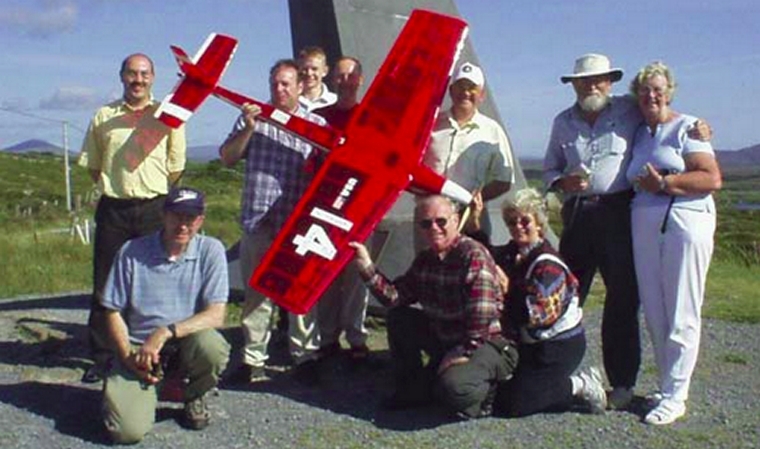 The Spirit of Butts' Farm (also known as TAM 5) was the first model aircraft to cross the Atlantic Ocean on 11 August 2003. The aircraft was launched from Cape Spear (47�.216'N 52�.428'W) near St. John's, Newfoundland and Labrador, and landed at Mannin Beach (53�.462'N 10�892'WCoordinates: 53�.462'N 10�892'W) near Clifden, Ireland 38.9 hours later. It was recognized by the FAI as a double world record flight for its duration of 38h 52 min 19 sec and straight-line distance of 1,881.6 mi (3,028.1 km) using an autopilot and using the Argos System for telemetry to track the flight's progress. The team's use of technology also spurred the FAI to create new record categories. The aircraft was controlled by autopilot for more than 99% of the flight in a manner similar to that used by the Insitu Aerosonde UAV "Laima" that crossed the Atlantic in 1998. The flight used 99.2% of its fuel and left only 1.5 US fluid ounces (44 ml) (or 44 minutes of flight time) remaining when it reached its destination. The aircraft was named after R. Beecher Butts, an aviation enthusiast who allowed the use of his farm for testing of the aircraft. The name echoes that of the Spirit of St. Louis, the aircraft used by Charles Lindbergh in his transatlantic flight. The aircraft is on display at the National Model Aviation Museum. A backup plane for the transatlantic effort is in the collection of the National Air and Space Museum. The information, views and opinions by the authors contributing to Pilot抯 Post are not necessarily those of the editor or other writers at Pilot抯 Post.